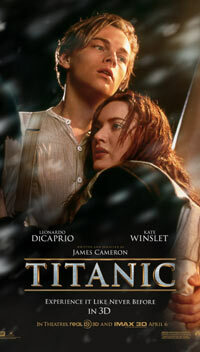 Titanic (3D), an English movie, is not currently screening in Hyderabad. James Cameron's 1997 magnum opus is re-created in 3D in 2012. It is set on the doomed passenger liner RMS Titanic, which sank in 1912, 4 days after setting sail. The love story celebrates the romance between Rose, a woman trapped in high society, and Jack, a carefree artist. It was the ship of dreams - one of man's greatest creations, an artist's delight, an engineering marvel, unsinkable. It sank into the Atlantic on the 14th of April 1912. And ever since, the disaster has fascinated earthlings - they've sent expeditions down to explore the wreck, they've written books, they've made documentaries, they've made movies, and they've made money out of all this. fullhyd.com has 700,000+ monthly visits. Tell Hyderabad what you feel about Titanic (3D), and then also see all user reviews for Titanic (3D)!